More commercial truck and bus drivers are using their safety belts, according to a recent national survey by the Federal Motor Carrier Safety Administration (FMCSA). FMCSA reports 86 percent safety belt usage in 2016 for commercial motor vehicle (CMV) drivers. This is a new record level since tracking began in 2007. In 2007, usage was reported to be just 65 percent, but has steadily increased each year. FMCSA, in partnership with the National Highway Traffic Safety Administration, has conducted the “Safety Belt Usage by Commercial Motor Vehicle Drivers Survey” six times during this nine-year period. Took place at more than 1,000 roadside sites nationwide. 83 percent on surface streets. Male CMV drivers were found to buckle up slightly more often than their female counterparts. Rates were 86 percent and 84 percent, respectively. The survey also examined whether regions of the United States differed in usage rates. Commercial drivers and their occupants wore seat belts at a rate of 87 percent in all but one region. Only the Northeast differed, with a significantly lower rate of 71 percent. 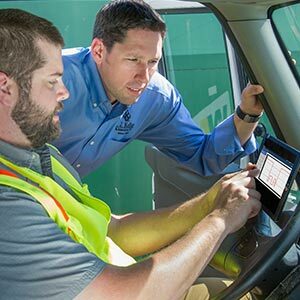 J. J. Keller® DOT Compliance & Safety Program Management Service provides a dedicated consultant who works with you to improve fleet compliance and safety.